When working in a team often times we come across the situation where we need to share what is on our screen. A screenshot is a still picture of what is on your screen. Following are different ways you can take screenshot on Windows. This method works irrespective of the Windows version you are on. So if you are on Windows XP, Windows 7 or Windows Vista this is the best possible and easiest way to take screenshot. > Open Microsoft Paint or any other image editor. > Press Ctrl + V which stands for paste. Screen shot softwares have run out of business over the time there but still there are many out there. Most of them carry too much ads to be trusted. Fortunately some of them are really simple and easy to use. 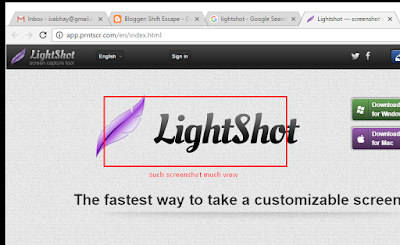 One such screenshot software is LightShot. Apart from this there is a tool that comes bundled in Windows now called Snipping Tool. It is simple and very much like LightShot only problem is that there is no way to set a shortcut key for taking screenshot. Which is why it is not as handy as LightShot. This isn't all that necessary if you are using LightShot already and it is just limited to taking screenshot of the Chrome Window only. Only good thing about this extension is that it lets you capture whole page as an image, which is nice. Apparently LightShot is best possible way for taking screenshot on Windows. The installer package is nice and the software is clean. There are no ads in the program although the site where the images are uploaded carry ads but that's still acceptable. Beware of the software that carry useless ads in the installer package and can ruin your computer and browser with ads and ads everywhere.